Not all are insulated, and there are many different kinds of garage door insulation. If your insulation needs repairing, you could be wasting energy as well as letting sound and other annoyances into your garage and home. Insulation seals the door away from the outside. Many people store things in their garage. If your insulation has deteriorated, everything in your garage could be at risk from the elements outside. Determine the type of insulation that you have before you get quotes on repairing it. Your door repair might depend on replacing the panels in your door. Garage door panels can become worn out from weather damage or from play (such as kids bouncing a ball against the door). They can also break due to automobile damage. Sometimes the windows that are set into panels can be broken. The cost depends on whether the panels are made of steel, aluminum, wood, wood composite, or fiberglass. Each material has a different cost. If this isn't the first time you've had to repair one or more of the panels on your garage door, you might consider using a different material and replacing the door all together. If your track is the problem, there's a good chance that you will have to replace it. Repairing part of the track on your is difficult because it is usually one large piece, so the parts on generally sold on their own. When building your garage, one important thing to remember is that it will become a part of your home. Hence, its design and color must complement that of the entire house's exteriors. 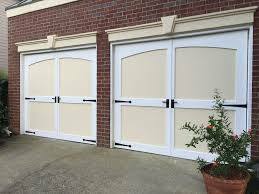 The garage doors are the main concern in building garages because they make up most of the overall appearance of the structure. After determining the size that you will be using for the garage door, the next thing to consider are the garage door panels. 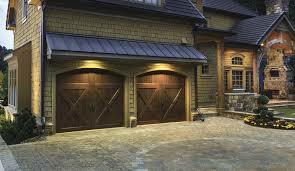 Garage door panels come in many styles and designs. The style you will choose will be made according to the size of the door and the overall general appearance. There are four common designs for a panel. FLUSH PANELS. These garage door panels are slightly textured and come with even planes. It is a simple style and it is designed to match the surrounding wall area of the entire facade of the garage. SHORT RAISED PANELS. These create depth to the face of the door. This design is recommended for the Victorian design homes which have elaborate details or for the solid architectural design of Tudor dwellings. LONG RAISED PANELS. These panels also present the element of deepness into the entire design of the garage. This adds more power to the appearance of the entire frontage of the door. PAINTED PANELS. These add more zing to the raised panel designs of a door. It provides more punch when the sloped area of the panel is painted with contrasting shades. Sooner or later, a replacement of your panels will become a necessity for you, because for one reason or another, your current panels may not be serving their purpose anymore. Once this happens, you may opt to find cheap garage doors and let a professional take care of it or you may install the replacement yourself. Replacing panels of the door is not too complicated which is why you can do it yourself. You will only need a screwdriver, a ratchet and socket, and the replacement panels. First, you only have to order replacement panels and have them delivered. Second, have the door removed. If you have the automatic type, be sure to unplug it first. After that, open the door manually and remove the springs. Separate the jointed panels until you reach the one that needs replacement. Be sure you know the mechanism of the door to avoid unnecessary damage to its mechanism. You may need the ratchet and socket for this and then the replacement proper. Attach the new panel to its place and re-attach the others. Once everything are in place, double check if the panels and the other parts of the door are fastened tight and secure. Lastly, have the entire door repainted to have the color of the panels match each other and the entire door. There are quite a few advantages to installing garage doors repair, among the greatest benefits is they offer greater safety to your house and garage. Most manufactures offer safety features as standard but you could also acquire extra security apparatus like an anti-thief back driveway that provide additional protection to your vehicle and other possessions on your garage. 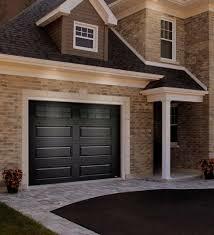 Modern doors have attributes which offer greater relaxation such as built-in lighting that change on each time you open up the doorway and computer controlled systems that imply that the garage doors will open for you. 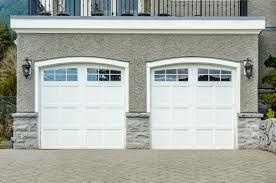 What kinds of garage doors can be found? There is a massive choice of garage doors available, and also an assortment of styles and methods to compliment most forms of house. The 3 chief systems accessible would be the screw-drive system that works with a lifting mechanism that goes along a steel pole and mounts onto the ceiling. The chain drive system that employs a string to move the doorway along a set of monitors, this method is very noisy but is frequently the most economical. The next platform is a computer-controlled system that's becoming ever more common. These systems can be found in many different styles from upward and above, side hung and ins-glide garage doors, so it is dependent on your own personal preference and what design you believe will best fit your own garage and the total appearance of your dwelling. That's the ideal business to put in your double glazing? There are dozens and dozens of organizations throughout the united kingdom from national chains to local independent businesses who can supply you with a fantastic support. It is possible to browse online, take a look at some neighborhood garage door providers or find recommendations from friends and loved ones. Prior to making a last decision, however, it's always a good idea to seek out estimates from at least three firms to make certain you get a professional service at a competitive cost. In addition, you will need to make certain your brand new garage doors adapt to EU standards and therefore do your homework on the business, their security features and their goods until you register for anything. Before you purchase a new pair of doors to your garage, be certain you adhere to the points over so you receive the ideal garage doors to suit your needs and budget. Your garage door cables are also known as torsion springs. This confuses many customers, because experts may refer to the component as a spring or a cable. In actuality, it is not a spring until it is wound around the shaft. Before the winding is complete, it is a cable. So, I guess you might say that both terms are correct. Although each cable is (or should be) made of a sturdy steel wire, one can break as the years go by. The average life expectancy of a cable is between three and seven years. The variance depends on the number of times the doors are opened and closed. This is why some homeowners only open or close them when it is absolutely necessary. When one cable breaks, you can expect the other to break in a relatively short period of time. This is why you typically buy them in pairs. It just makes sense to replace them both at the same time, because the job is tedious and can be dangerous. Since the springs are under high tension, it is important to view this task as hazardous. If you are unfamiliar with the tools, you are better off calling a professional. The springs are dangerous when they break, too. Luckily, they usually break during the closing operation, rather than the opening. If someone is inside, there is a risk that the loose piece of cable will hit them. Some manufacturers install safety mechanisms to help keep that from happening. If you decide that replacing the garage door cables is something you can handle on your own, you will need to measure the existing cable. The most common lengths are 7 and 8 feet, although an older style or defunct manufacturer might have supplied something different. It could be difficult if not impossible to measure the broken cable. You can always find out which length to order by calling the original manufacturer, if they are still in business. The information may also be available online. Before you can install the new cable, you will need to remove the existing spring. There are special tools designed specifically for that purpose. The job involves cutting the spring or unwinding it. Once the old springs are off of the shaft, you will need to wind the new garage door cables around it. This is accomplished using the winding cone. The cable must be wound in the correct direction. Otherwise, the springs will come loose from the cones. The winding bars can slip out of the cones if you are not careful to be sure they are fully inserted. This happens even to professionals. Although the more experienced professional can replace the springs in what seems like no time at all, everyone has trouble with them sometimes. Most professionals stretch the springs after the winding is complete to ensure that the shaft floats freely. You will also need to stretch and test the springs to be sure that your garage installation was done correctly. If the springs bind or catch, your doors will not close completely. It might still be necessary to call for help even after you have done your best with the new garage door cables. It's nothing to be ashamed of. It happens to the best of us.